Nothing says autumn more than pumpkin! 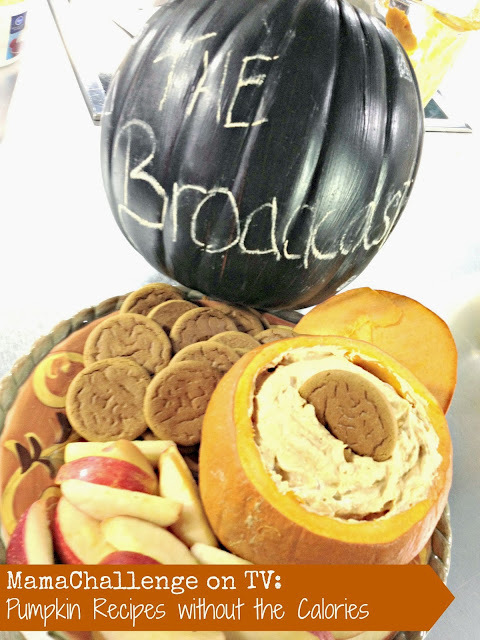 So today to kick off my favorite season, we whipped up two delicious recipes that can help satisfy that pumpkin kick you are on (and everyone else on Facebook and Pinterest) on KTXD The Broadcast this morning. Did you see what I forgot to put in that shake? That’s right. The banana. Very fitting for my slip-up! But when you are doing live tv you just smile and move on! Watch it again and see if you see my reaction when I realize I forgot! Did you also see that adorable chalkboard pumpkin on the table with the TV show name on it? My friend Shannon at MilkandCuddles.com made it and it fit perfectly into the show! THANK YOU FOR ALLOWING ME TO USE IT! Place all ingredients except whipped cream and granola in a blender and blend until smooth. Mix above ingredients and serve with graham cracker sticks, apple wedges, or ginger snaps. I didn’t even notice your reaction! You’re a natural on TV! Great job! Great job, like a PRO! That necklace, too cute! You did an awesome job, as usual, girl!! You look awesome. What a delicious shake! Love The Broadcast, by the way.